With Self Ligating braces, achieving an attractive, healthy smile has never been easier or more comfortable. 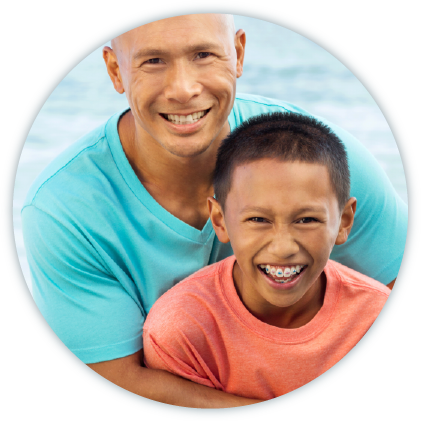 Their unique, patient-friendly design means that you have reduced discomfort and far fewer appointments than with older style braces. The Self Ligating Braces System is a comprehensive, aesthetic and technologically advanced approach to braces. Self Ligating brackets utilize a permanently installed, moveable component, or "door", to hold the archwire in place, eliminating the need for an elastic ligature (bands or ties). The use of this "door" reduces the amount of pressure exerted on the teeth. Self Ligating brackets feature a low profile design and smooth curves for greater comfort and improved appearance. The brackets are easier to clean and somewhat more comfortable than traditional metal brackets with reduced treatment time, fewer and faster adjustments, better oral hygiene and the control required for optimal orthodontic results. Self Ligating braces are gentle because they softly guide your teeth into alignment. They utilize a free-sliding technology which places little to no pressure on teeth. As a result, your treatment not only takes less time and requires fewer appointments, but is far more comfortable than with traditional fixed-wire braces. A dynamic, healthy and attractive smile!